Paw Print Genetics™ is a clinical laboratory dedicated to screening and diagnosis of genetic diseases and carrier states for all dogs. In deciding to start my second company, I engaged the help of my family members. My husband needed to be agreeable to investing (emotionally and financially) in another (yes, another) clinical laboratory. But this time, it would be ours and we could make the decisions, good or bad; we would be responsible for its successes and possible failures. After convincing him that Paw Print Genetics™ is a great idea, we started doing our homework. It is important to know the market. Our market is dog lovers; not a small market. They include owners, breeders, trainers, veterinarians and all the dogs that they breed, train and sell. Every dog deserves optimal genetic health. Next came the science. Our staff spent months identifying the known genetic mutations in dogs and developing tests to accurately identify whether a dog is normal, a carrier or affected with these diseases. Some may ask “What does a human geneticist know about canine genetics?” Compared to the human medical literature, I was surprised how little is known about canine genetic diseases. The opportunities to make a difference for “Man’s Best Friend” are enormous. Because of the way humans have bred dogs and produced reasonably inbred lines, canines are better models for identifying disease mutations than humans. The Paw Print staff, which includes another PhD and two Master level geneticists, will take our knowledge of the human genome and the known 2,700 disease genes identified in humans and systematically identify disease mutations in dogs that have eluded other researchers or have not come to the attention of the research community. We will link other researchers to the DNA samples that we have banked. We have already been approached with samples for diseases in which the mutations are not known. Since we can’t do it all, we will collaborate with other researchers to find the mutations. Finding the mutations will allow us to provide diagnostics and screening for additional diseases to avoid these diseases in breeding. My other family members pitched in too. My oldest son took the photographs of Trixie the Wiener Dog, our “spokesdog” that we use on our website. 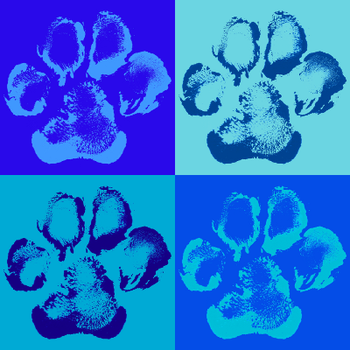 After Trixie walked through nontoxic paint, my son digitized her paw print and produced the image that we use for our logo, stationary and art in the office. My second son has participated in the collection of cheek swabs from the clinics arranged locally by my mother. He has become the expert “cheek swabber” for even the wiggliest of dogs. My daughter, an expert writer and editor, has helped with review of marketing materials and photographs that we use to reach potential customers. Finally, our two rescue dogs, Bruno and Gracie, along with Trixie the Wiener Dog, gave those critical, first samples so that the laboratory had samples on which to practice. In doing so, we found that Gracie (and Trixie) are carriers of PRA-crd4. Because of the specific breeds that are known to carry this particular mutation, it confirms that Gracie (and Bruno too because they are siblings) have Labrador retriever in them. Of course, we already suspected this in their appearance and the fact that they cannot walk past water without jumping in! So everyone in our family, right down to the three dogs, participated in getting Paw Print Genetics started. Our “family” continues to expand with the fabulous staff that have joined us and all the new friends we have through the Lilac City Dog Training Club in Spokane and those that we met at the Rose City Classic Dog Show in Portland in January. We will be forever grateful in their generous contributions of cheek swab samples for our validation studies. And our family continues to grow with all of the interest we are generating from our website and our Facebook pages. We have received so many wonderful comments of encouragement and excitement for our upcoming launch of our clinical laboratory. It means so much to us that our efforts are needed and wanted in the community of dog lovers. So as we move closer to the launch of our clinical services in April, it reminds me of how important family is. And family means our relatives, coworkers, new friends, and of course, our four-legged family members that need us to care for them in all ways including their genomes and helping others avoid the genetic diseases that can affect our “family”.